One of the blogs I read is Zain Naboulsi’s Visual Studio Tips and Tricks. 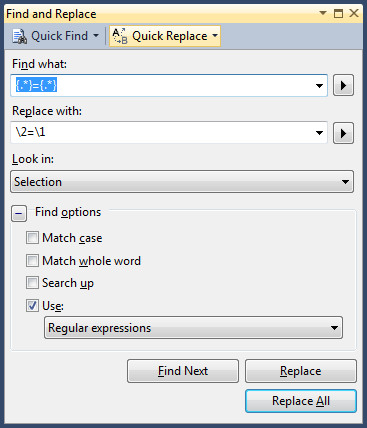 In a recent post he discussed the power of using Find and Replace with regular expressions and it gave me an idea about how to quickly reverse a set of assignment statements. This works because the expression matches any character (.) zero or more times (*), followed by an equals sign then any character zero or more times. In other words, anything followed by “=” followed by anything. The two anythings in the expression are enclosed with curly brackets to make them tagged expressions, which means they can be used in the replace expression. \1 will be the first tagged expression, \2 then next and so on. So our replace with expression just says replace a=b with b=a. Awesome tip thank you. I have never actually thought about using that before, but after I read your post it completely made sense to do it. Like you say if you are doing any type of Automapper stuff, or reassignment statements this can become quite tedious! Resharper has a reverse assignment quickfix. There are loads of tools to do this, including many macros, but I really liked this light weight, build-in solution. That will take care of the semicolons.